A terrible film that I watched thirty years ago. I was aged five to fourteen in the 1980s, the perfect age range to be subjected to the then fairly new (to the West anyway) pop culture concept of ninja. For most of that decade movies, video games, toys and pretty much anything that was aimed at young boys was regularly had “ninja” added somewhere. I was indoctrinated: if anything can truly be described as cool, then ninja can, as far I am concerned. 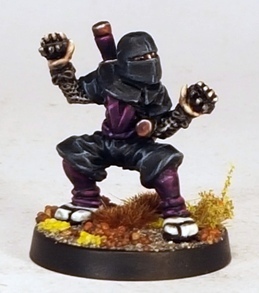 These old Citadel ninja models are the reason that I chose to put together a fantasy Oriental warband. They are petite, characterful and a little retro, I like them a lot. I originally bought them for use as Foot Clan warriors for a planned TMNT project, but they had sat in the box unloved for a while. 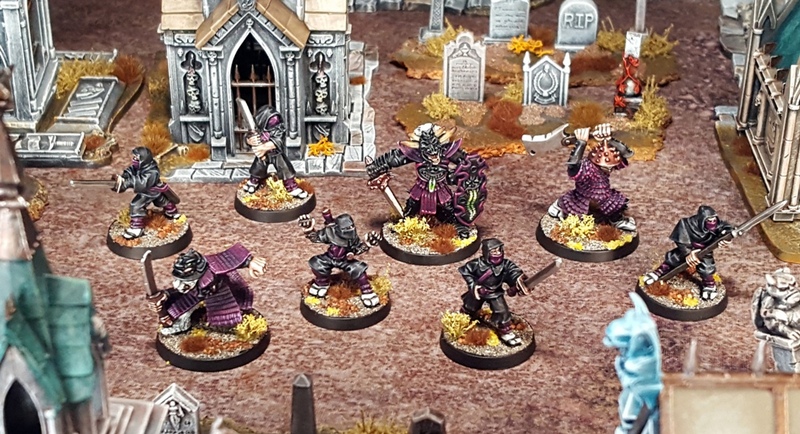 One of the popular colour schemes for The Foot – black and purple – was chosen to suit these models. that it turn led to the warband as a whole using largely the same palette (as can be seen in the first mostly samurai themed Shonen Knives post). Very many Citadel ninja were sculpted by the Perrys back in the day. The variety makes them a fun range to paint and game with. For skirmish games in particular, there are numerous different equipment types covered in the standard models and there are few iterations that will end up being duplicated in a force. 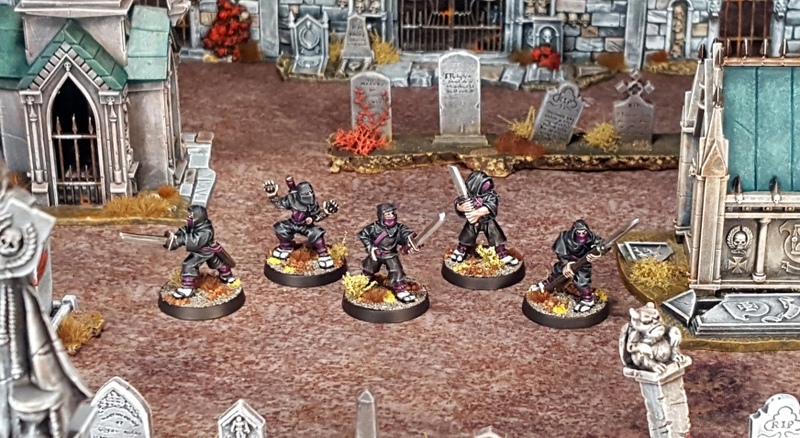 If anybody reading this has some spare ninja from this range and would like to sell or trade them, then please get in touch. 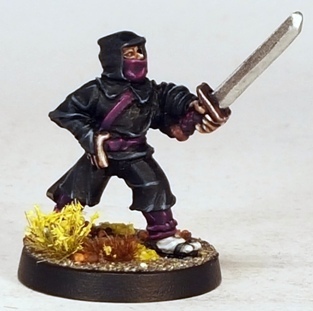 The guy with the blowpipe is particularly high on my list of miniature ninja desires, but I am looking for several of the sculpts in the catalogue images shown. Rather than being the super cool one man army type of ninja, my Frostgrave force will observe the Conservation of Ninjutsu rule and consist largely of ninja cannon fodder. Despite the highly trained, lethal nature of ninja, incompetent ninja (or “nonja” to quote Pops Racer) are common in media. 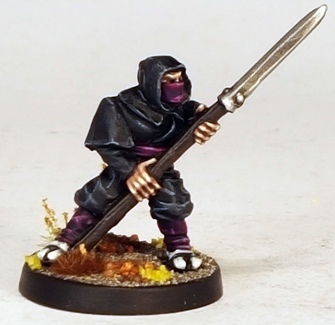 In terms of rules I have yet to really think much about how to include these ninja in a Frostgrave warband, what “Soldier” type(s) they may represent. For now I am just picking ninja models from the pile and painting them. It will all work out Im sure. 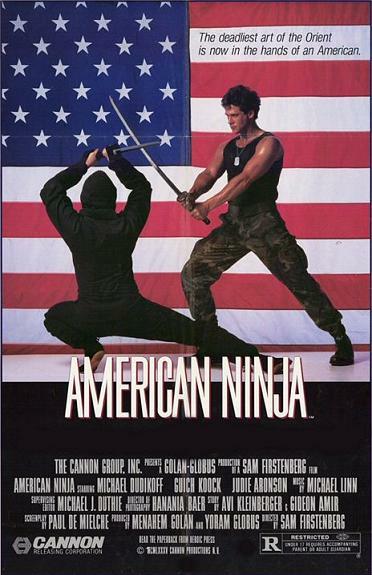 Obvious double handed weapons will make the ninja an Infantryman, like the guy above. Despite the rather funny pose (complaining about silly poses for ninja would be daft, so I wont mention it again) I think that the ninja above is my favourite out of this batch. Due to the prominent “tekko-kagi” (claws) I thought that this guy might be suited to being fielded as an investigative Treasure Hunter. I will have to take another look at the rules later to confirm. Next on the Shonen Knives painting list will likely be either oni or unarmoured samurai. Im looking forward to getting stuck into both. Really nice looking ninja. The tabi were a good choice, it lifts them pleasingly off the bases. Your warband is filling out alarmingly quickly. I saw a classic 40k assassin with white tabi several years ago and I loved it. I copied it when I painted my copy of the same assassin model not long afterwards. After that it seemed obvious to paint white tabi on these guys too. Its iconic and characterful, as well as being useful for lifting them out of the rather busy bases. The warband is filling out rapidly all of a sudden, Im pleased to say. I want to cover as many options in the Frostgrave rules by powering through as many figures for this as I can manage over the next month or so. Thanks for the feedback Dave. A ninja leaps from atop a pillar to be felled by a roundhouse kick. Another takes a chop to the throat. A third is pinned to the wall by shuriken…and so it continues. Lovely painting on these…You’ve elevated the black outfits with the white socks of all things! It’s a little touch, but incredibly effective. I can see these in a Nippon warband, battling Dredd, or as throw away goons used by your Imperial Assassin. The possibilities are endless! Thanks for the kind words Axiom. Ninja are ubiquitous alright, like zombies, they fit anywhere. They will work as cultists in either fantasy or 40k type games even. Awesome ninjarage! 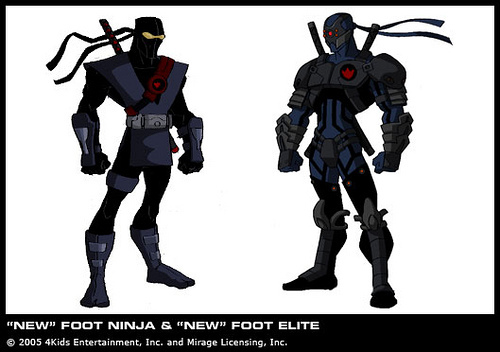 I look forward to giving them the foot clan treatment. Did I tell you my captain is called Raphael? On behalf of all the ninjas around the world : thank you. The ninja have heard the silent call Asslessman. They flock to my banner. Lovely! Can’t wait to see what you do with mine (technically now yours), I’ll take them to the post office tomorrow! One of the guys that you are sending is in mid kick, which is quite fun. I have another sculpt of a kicking ninja too, so I will likely include them in the next batch of ninja to be painted, whenever that happens. Its looking more and more like some unarmoured samurai/ashigaru next I think. Very nice work and a very cool concept! The concept of fantasy samurai and ninja scratches a lot of itches for me, the pseudo historical, bluffers guide elements required have appeal too. Awesome job – ain’t nothin’ cooler than a bunch of ninja! Im glad that you like them Alex. Nice are crowd pleasers beyond compare really. Very fun, and as you say a great way to suddenly have miniatures for a bunch of different games, rather than something just useful for one. I like that they (or their wives) forgot to wash the black socks this week, a problem that I am sure many office workers can sympathize with. Being slightly younger than yourself, the call of the ninja is not quite so strong for me, but I certainly appreciate faceless mooks who get easily cut down by heroes. Or, hopefully in your case, facelessly cut down someone else’s heroes (if only through numbers). I only own black socks. Like Einstein. Or possibly just like a crazy sociopath. The jury is out. In the broad spectrum of ninja efficacy visible in media, I am sure that you and I can find a favourable compromise point Mr Packer. If pyjama clad faceless mook is where that point is, then so be it, and we can build on the relationship from there. Excellent sujet and paintjob! The blacks definitly register as black, and the TMM looks excellent. Finally adding a dark purple and white socks does add interest and provides something to guide the eye and pronounces the different textures/elements. I view things like theis very much like bad guys in a comic or cartoon. A defining silhouette, broken up by a simple two tone scheme is reasonably quick to apply to larger numbers and reads well on the table. I am glad that you like it daggerandbrush, thanks for the feedback! Nice figure selection once again. I remember using the second from the left figure as a basis for a bespoke Blood Bowl team back in the 1990s. I remember that old Ninja list, it was one of the first internet based gaming community things that I came across. There were rules for a player called Oroku Saki (which is the “real” name of The Shredder from TMNT). Do you have any images of the team by any chance? Im envious of your Talisman ninja BTW! It took most of a day to do, and being over 40 I had a sore back for a couple of days after from all the bending and lifting! I also found I had more assembled and unpainted figures than I thought, so there’s plenty more to add! The Ninja was an engagement present of all things from many years ago now. A friend found a box with the Talisman Adventure figures in it, except when I opened the box the Samaria and Witch Doctor weren’t GW figures. No idea how that happened. Yes, I also have often felt the need for a horde of ninjas (with the Conservation of Ninjutsu rule ruthlessly applied) as opponents for my little adventurers. Great execution of the concept! I am envious. 28mm ninja are definitely something of a bucket list item. I have a few more lined, I hope to have a sizable faceless horde in the not too distant future. Growing up watching the same crap Ninja films had the same effect on me and I had to dig a Ninja out of the lead pile when I played Mordheim last year, ESPECIALLY when I found out you could use throwing Knives (stars!) as a skill upgrade!! I have some spares in the lead pile if you still want some more. PM me on the Oldhammer forum. If Mordheim comes up on the schedule again in future, these guys will be definitely be my go to guys. I don’t paint many fantasy figs, so I plan to squeeze the Shonen Knives into whatever comes up. I will definitely get in touch re more ninja Riot, nice one!